Brandon and I arrived in Auckland on November 7th to begin our last adventure traveling together before we move to France in January. We agreed to go big in New Zealand for the next four weeks, and aside from our “budget” campervan, we followed through with that promise. 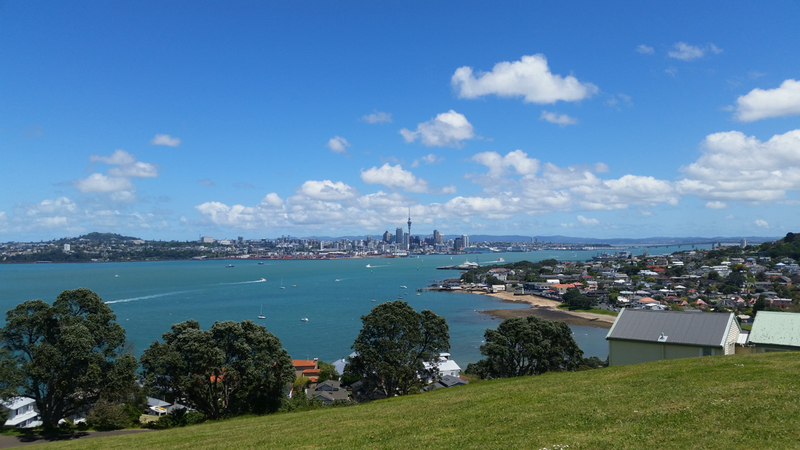 Brandon and I spent the first 4 days in the trendy Ponsonby area in Auckland to tour around the country’s largest city by population and roughly sketch out our plan to tour the rest of NZ. 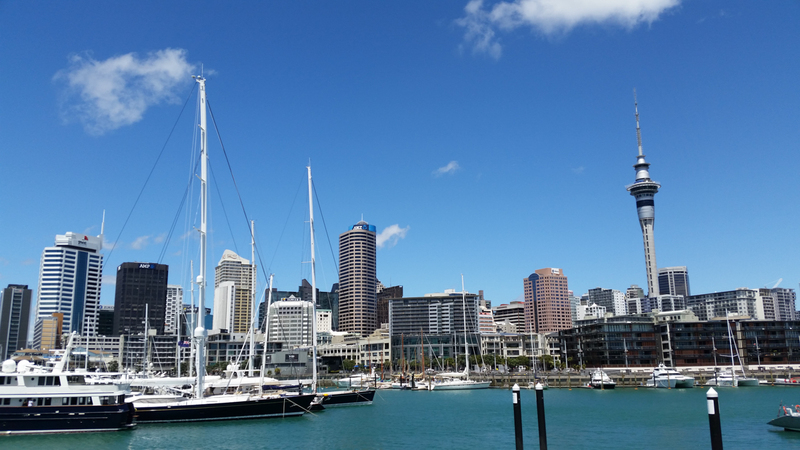 NZ has a total population of about 4.5 million and about 1.5 million are living in Auckland. The number of sheep in NZ, on the other hand, tops over 60 million – approximately 13 to 1. One would think that wool is NZ’s greatest export, but it’s actually dairy! As we witnessed firsthand while driving some 5,000 kilometers throughout the country, the livestock in NZ live happy lives in large green pastures they can roam freely. I can’t help but share these stats because we had just come from Shanghai (city population 24 million) and Singapore (city population 5.5 million). Compare NZ’s landmass of 100,000 square miles to Singapore’s of 277 square miles, it was like night and day to what we experienced a few short weeks ago. 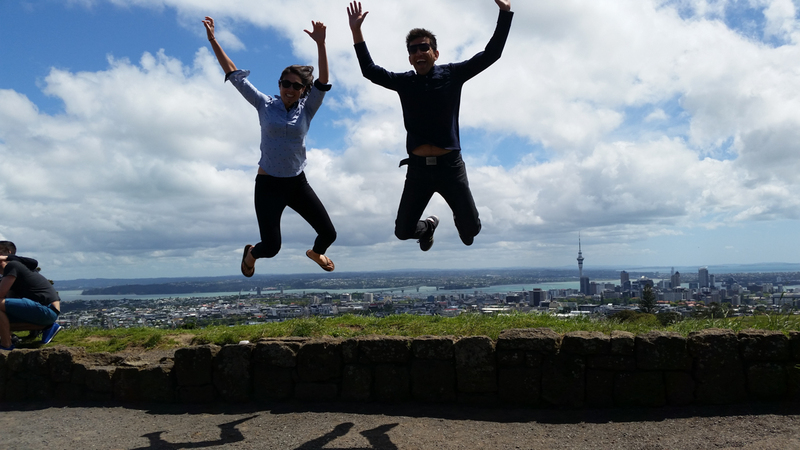 Prashant and me jumping for the camera to capture an INSEAD moment in Auckland! 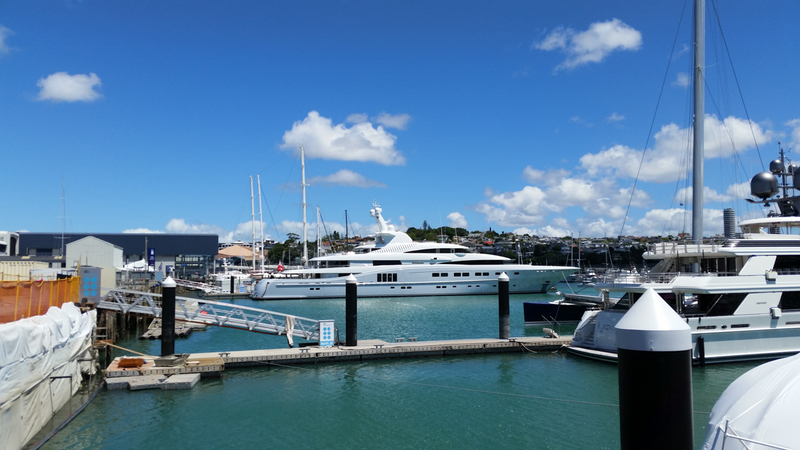 Marina in Auckland near the location of the America’s Cup in 2000 and 2003. Some big nice yachts in there! Another part of the marina housed some beautiful sailing yachts … these are more Brandon and my style! Brandon and I met up with Prashant on our second day in Auckland where we went on a tour to check out the views from various vista points around the city. It was absolutely beautiful. We took an obligatory INSEAD moments photo to let our class know that there were at least two of us celebrating our pre-INSEAD days in NZ! Prashant also brought us to a marina that held some incredible yachts and sailboats docked in the same location that had been the center of the 2000 and 2003 America’s Cup races. Later we stopped off along a beach to have a couple of drinks and to enjoy our first (of many) NZ burgers. I was pretty quickly falling in love with NZ. We had a great time with Prashant and learned a ton about NZ. He left us with many ideas of things to do and must-see places both in Auckland and around NZ. I’m still trying to convince him to start the program in France, but unfortunately my time is running short and I may just have to wait until Brandon and I move to Singapore the second half of next year. That night, Brandon and I walked over to the Sky Tower in the center of Auckland to check out sunset views over the cityscape. We topped off the night with about as romantic a dinner as I could ever squeeze out of Brandon, a bottle of wine with an amazing meal on a slowly spinning platform overlooking the city. Many brownie points were earned that evening (thanks for the rec Prashant!!). 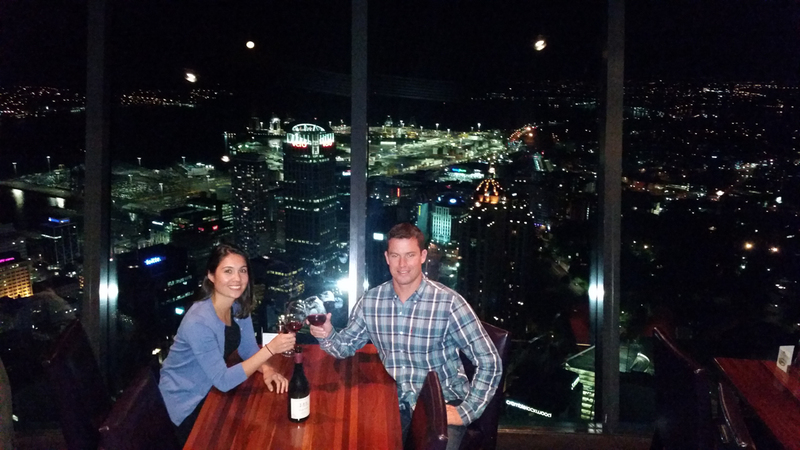 Dinner at the revolving restaurant at the top of the SkyTower overlooking Auckland! The next day, it was time to pick up our campervan, which would act as both our transportation and home for many nights around New Zealand. We settled on a budget that would cost ~$1,150 for 23 days, including unlimited mileage. It was a cozy, trusty, eye-sore of a vehicle which we would come to love. It had a huge sticker of an Australian rugby player, obvious due to the yellow shirt and green trousers, stuck to its side which more than once arose the playful contempt of the Kiwis. The van was minimally stocked with sheets, pans, plates and few other essentials. When I say cozy, I mean it was a tight squeeze for us both to sleep in the back … when we put the cushions down, only one of us could comfortably lie on our backs, while the other would have to sacrifice and sleep on his/her shoulder until the other was ready to flip onto his/her side. After the first few nights, we grew accustomed to sleeping in the van and it became natural and surprisingly, comfortable. This would be a first for us – living out of a minivan on the road for over 3 weeks. 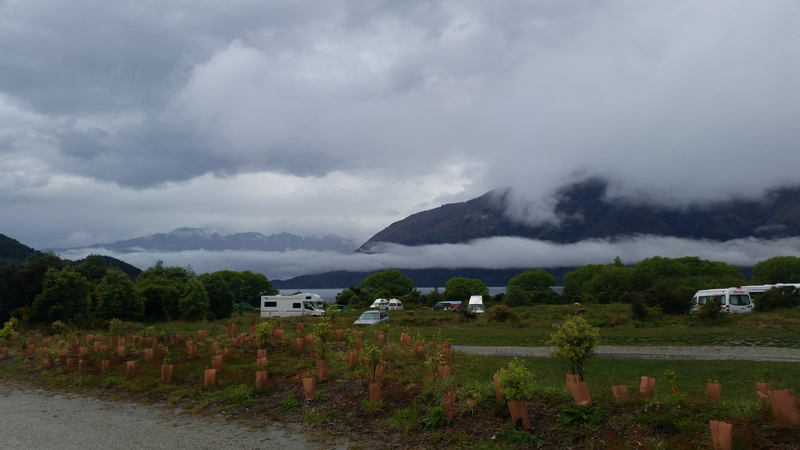 The best part of living out of a campervan was the freedom that it afforded us; we woke up in a different part of NZ every morning until we reached Queenstown. 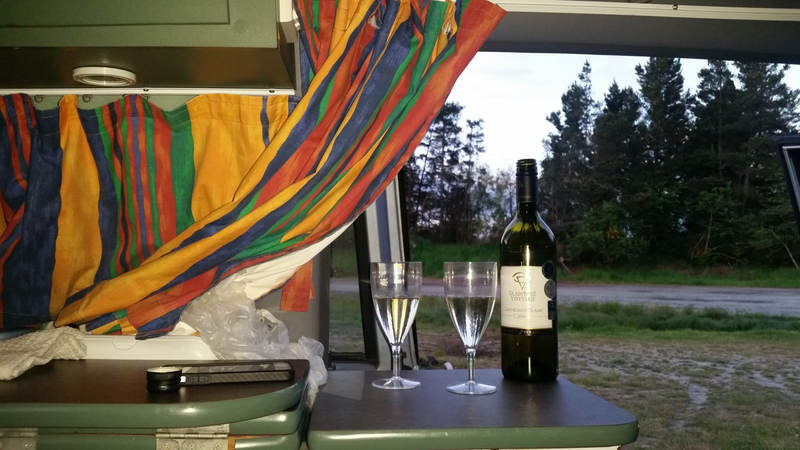 Our home on wheels – the Amazing Campervan! 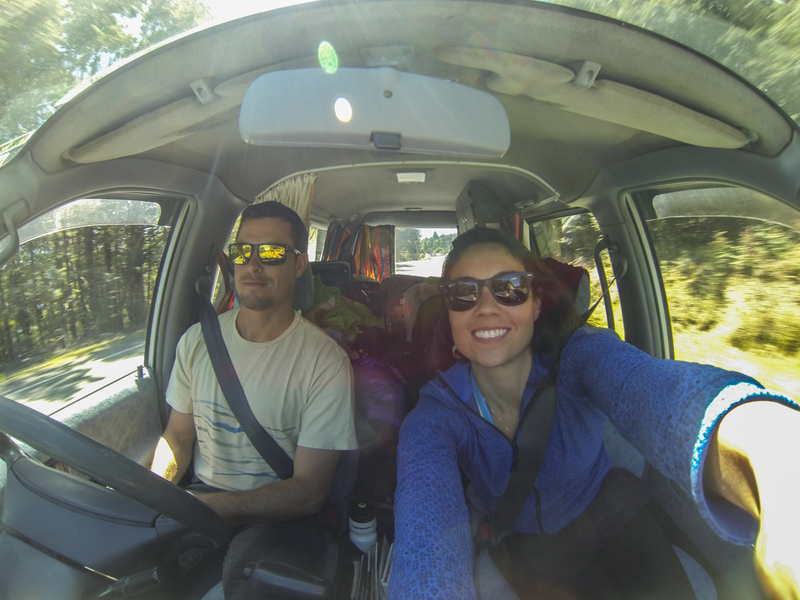 Roadtripping to Milford Sound in the camper van! 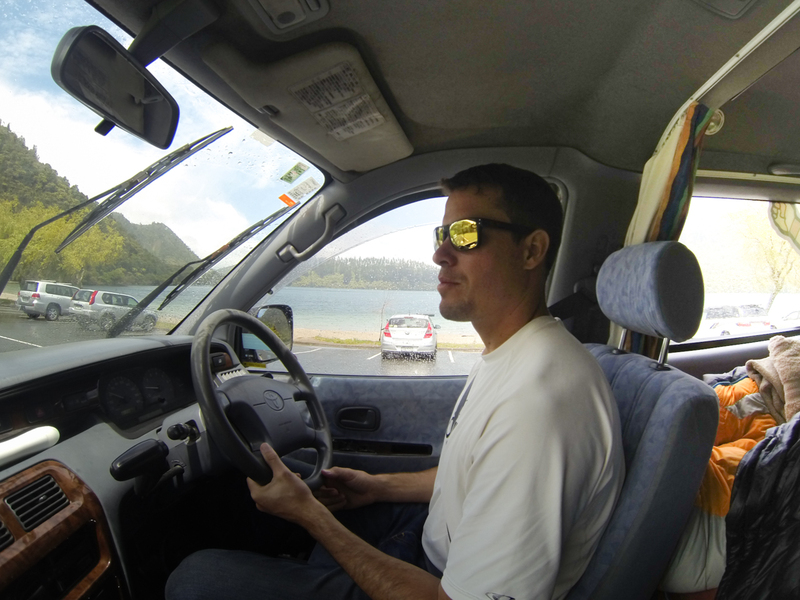 GoPro selfie during a stretch of the NZ drive! 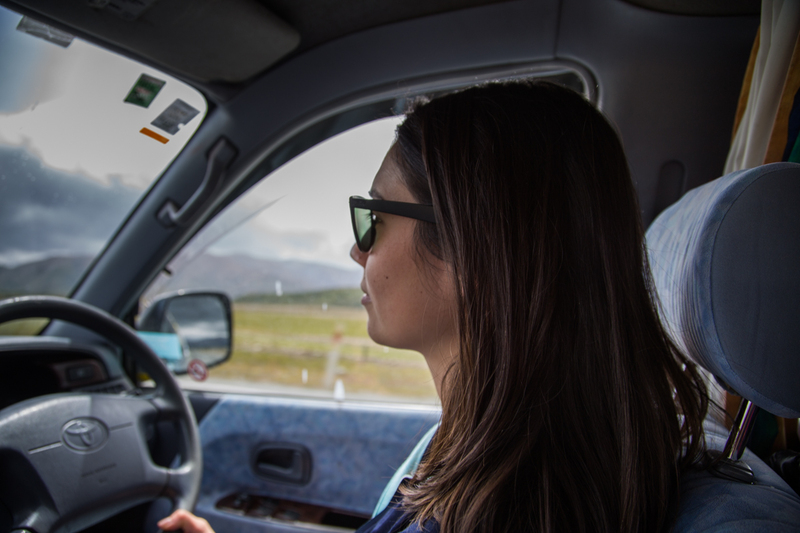 Seeing that many visitors in NZ choose to roadtrip around the two islands via car or campervan, NZ has made roadtripping very easy and convenient. 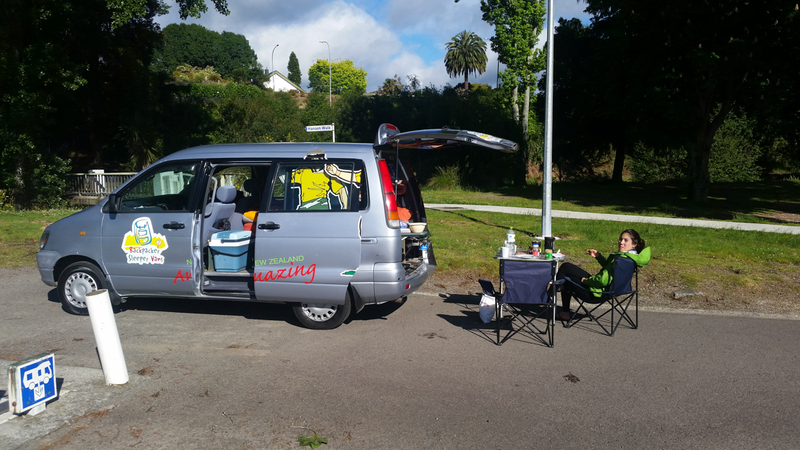 Brandon downloaded a Camping NZ app to his phone, which gave us all the information we needed to find a place to park our van and crash every night no matter where in NZ we were. The campsites ranged from full service motels offering basic private rooms for about ~$80 to so-called “freedom camping” sites that were more like free picnic sites on the side of the road. Most nights, Brandon and I posted up on what they call “unpowered vehicle sites”, which simply meant we paid for a flat square patch of grass to sleep in our van. The price for the night ranged from $20 – $40 per night, which gave us access to a communal kitchen, bathroom and hot showers. A handful of nights, mainly when Brandon and I thought one more elbow to the face might cause a physical fight between us, we decided to get a small motel room for a few more inches of sleeping space. A couple of times we also chose to “freedom camp”, but this was a little risky in our budget campervan because in order to legally freedom camp one is required to have a “self-contained” sticker on your vehicle, which certifies that you have a working toilet on board. 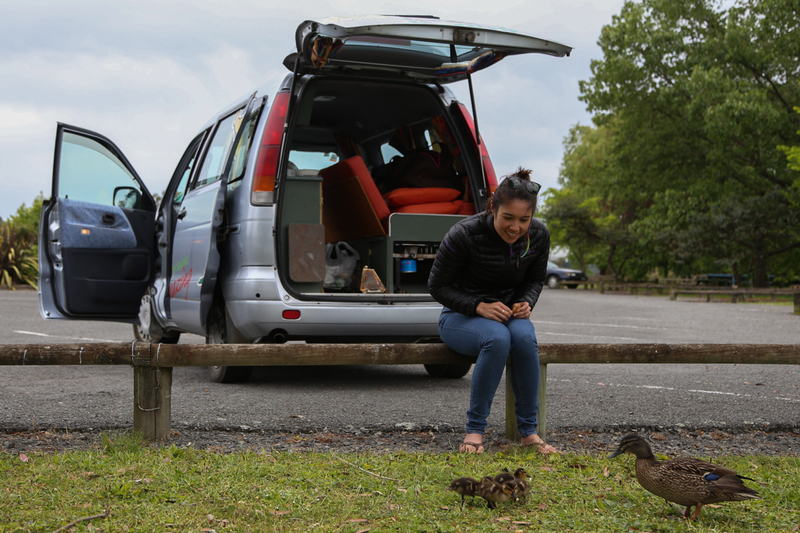 Overall, after experiencing campervan roadtripping around NZ, I can vouch that traveling by campervan is a great way to see NZ; the roads are great and there are campsites/motels every few kilometers along most roads and anyplace remotely frequently by travelers. 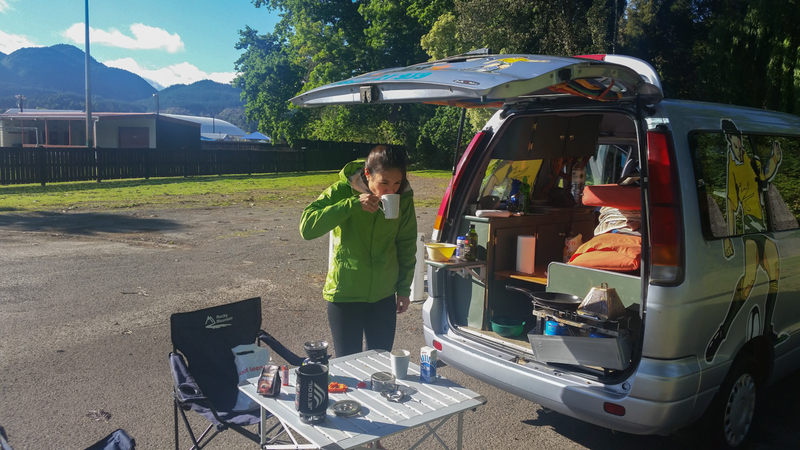 Many mornings we made our own breakfasts directly from the back of the van or kitchen (if the campsites provided one) and enjoyed a cup of coffee together to kickstart our day. Brandon learned to master the art of on-the-road gourmet coffee using his Jetboil plus its handy plunger press accessory. 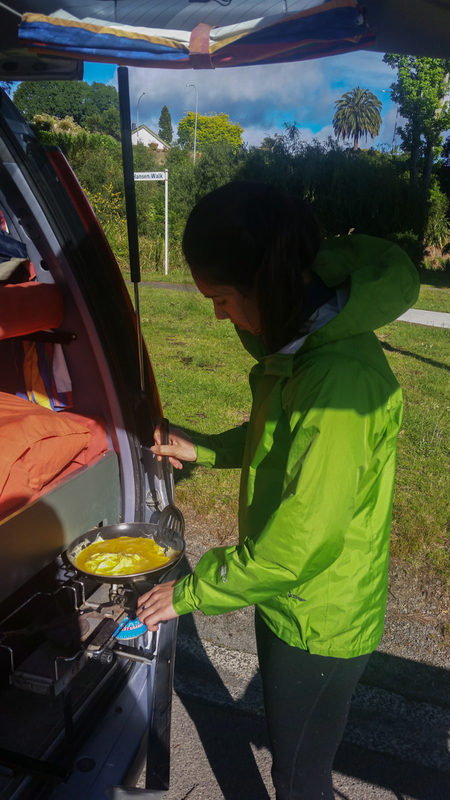 Our meals were basic: scrambled cheesy eggs with veggies and toast or oatmeal with local honey and bananas. I have learned to love camping for the way it temporarily strips complexity from daily life: cooking basic meals with your partner, enjoying the art of conversing without distractions from the internet or TV and sleeping as much as you want! 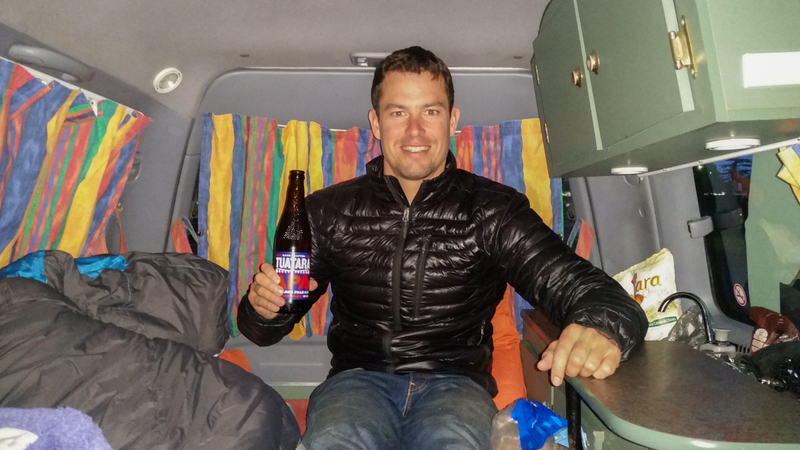 Enjoying one of Brandon’s morning brews from our freedom camping site! Breakfast of champions from the back of the van! Living the good life from our camper van! On our first night with the campervan after departing from Auckland, we pulled into a small museum’s parking lot, which allowed campers to crash overnight. Brandon and I were hunched over trying to pull the sheets over the seat cushions while swatting flies off our legs to make our bed for the night. Not even 10 minutes later, a McMansion on wheels decided to drive in and park right next to us! The Britz was a luxury self-contained mobile home with the bed on the roof, stovetop and microwave, power outlets, a bathroom, and even a primitive shower. This thing was fully stocked, putting our little guy to shame! What our guy had was character, 340,000 km of experience on the NZ roads and most importantly us, so after a good laugh and a hint of jealousy, we settled into our sleeping bags and crashed for the night. Later on we couldn’t resist the temptation to analyze the pros and cons of our budget campervan decision against the other, more luxurious campervan options. 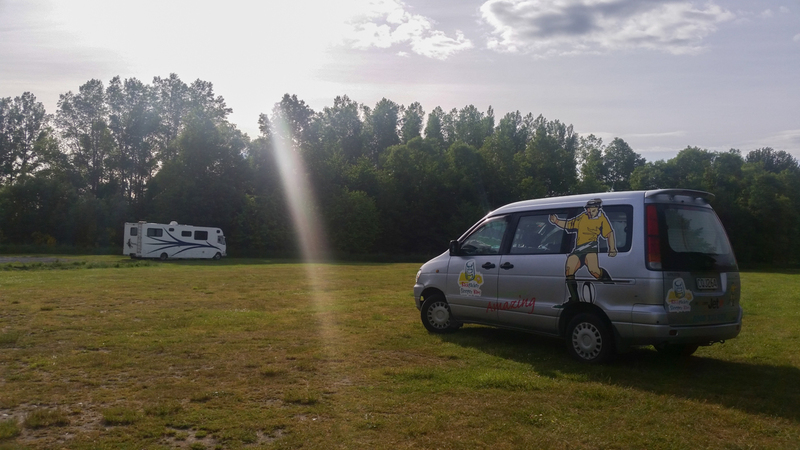 It turns out that a decent motorhome like the Britz would run more like $150+ per day in the high summer seasons versus the $50 we were paying. A bigger campervan would comfortably sleep 3 or maybe 4 adults. You’d get the option to save some money by freedom camping (legally), but my guess is most nights you’d still end up at a campground and thus paying $30-50 per night for a powered site. Also, gas would cost more and the vehicle itself would be slower and less maneuverable to drive, which is an important consideration in the harsh and windy road conditions that NZ can present. In the end we were happy with our decision to go budget for the two of us on this trip. Doing so incentivized us to spend more time away from our van to explore the beautiful country and the extra money spent on the luxury of a big van would’ve been wasted. 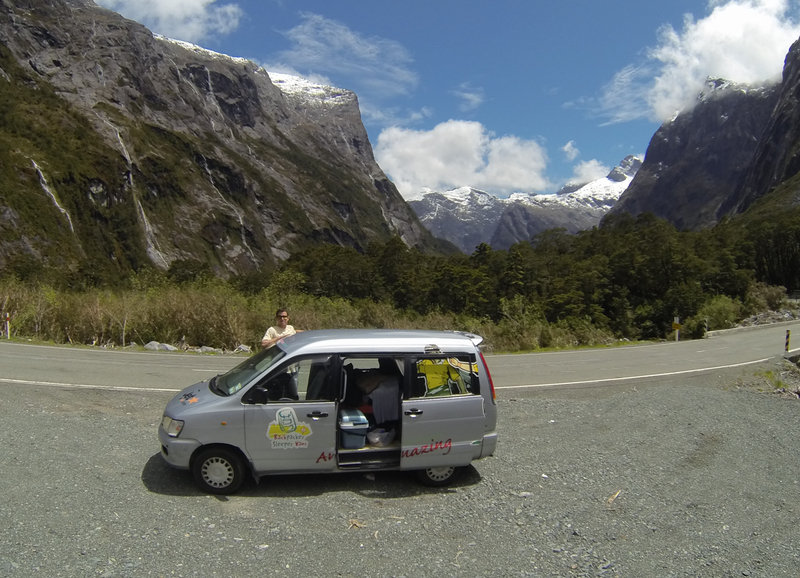 If we come back to tour NZ with other people or a family, the bigger campervans will make much more sense. … and here I am putting some KMs on the van! 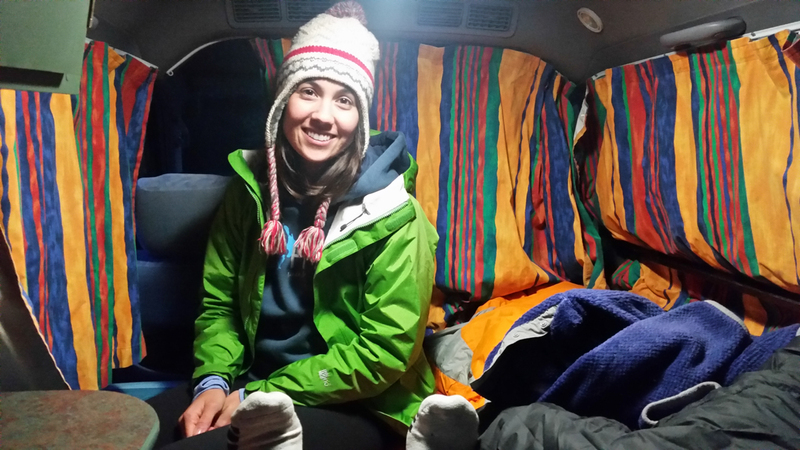 Our sleeping area in the van was overly comfy, but we learned to love it. And those Curtains! 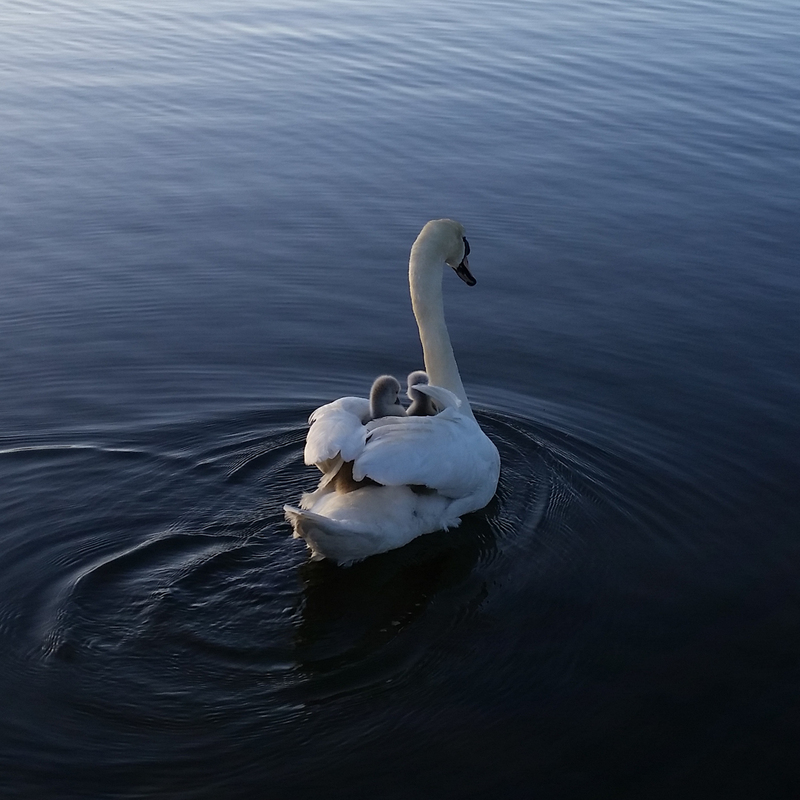 I included this pic because who doesn’t want to see baby swans on their momma’s back! The next few posts will chronicle our adventures around the North and South Islands of NZ !! Ahhh I just love this and your campervan! What an amazingly fun experience!! Wow! Unreal you two… Brandon, Happy (raddest) Bday ever and Donna, huge congrats on INSEAD! I don’t know, if you are still checking this website but if yes, can I ask you where you have rented this campervan? which company? thanks!